The spot-on impressions done by Steve Coogan and Rob Brydon in The Trip to Italy tilt toward mockery. Consider: When a smart mimic captures a well-known personality, the impression tends to underline the ways in which a distinctive talent may have veered toward shtick. 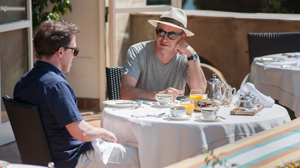 Coogan and Brydon — who qualify as very smart mimics — previously teamed in 2010’s The Trip, which was directed by Michael Winterbottom who again takes the helm. This time, Winterbottom creates space for Coogan and Brydon to do their bits as they travel through Italy’s splendid Amalfi Coast — a job that’s no hardship for anyone involved. There isn’t much to the story, but low-key professional jealousy between the two comics spices the proceedings. If you saw Coogan and Brydon’s respective Michael Caine impressions and Brydon’s Al Pacino in the previous movie, you may fault this one for not breaking sufficient new ground, but I didn’t mind. A bit of personal drama intrudes: Brydon has an affair with one of the crew members (Rosie Fellner) of a sailboat the two board. He’s evidently having marital problems. At one point, Coogan’s teenage son joins the food tour, which purportedly is being sponsored by a British newspaper. Despite hints at real-life problems, neither Coogan nor Brydon seems particularly angst-ridden. That makes The Trip to Italy a pleasantly witty journey through Italian cuisine as hosted by two men who admit that they don’t qualify as food experts. If there’s a competition between the two men, I’d give the advantage to Brydon, who never misses a beat when it comes to turning any situation into an amusing riff. Viewing requires tolerance for two guys who always seem to keep their comedy meters running. And, yes, that can be a trifle overbearing, like a bright light that never shuts off.